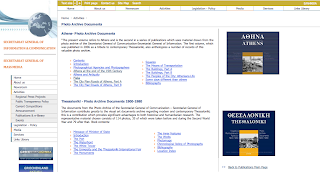 The Secretariat General of Information & Communication along with the Secretariat General of Mass Media of Greece is offering two very interesting photo archive books 1900-1980 online for FREE. One book is on Athens, the other on Thessaloniki. Note: On a personal level, I LOVED looking at these books. “The present volume refers to Athens and is the second in a series of publications which uses material drawn from the photo archive of the Secretariat General of Communication-Secretariat General of Information. The first volume, which was published in 2006 as a tribute to contemporary Thessaloniki, also anthologizes a number of records of this valuable photo archive.